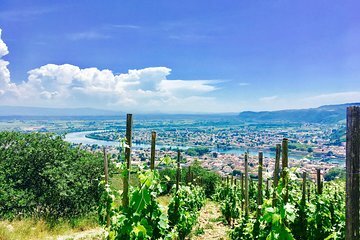 Part of the Rhône Valley wine region, Côtes du Rhône produces some of the most renowned wines in France, most notably its full-bodied reds. On this tour, enjoy an intimate tasting experience at two wineries in the Hermitage and Côte-Rôtie appellations, meet the winemakers, and sample a variety of Côtes du Rhône wines. Julie was a fantastic host. Group met around 9 at Bellecour square. It was a small group of 8 people and we took a van to our first winery where we sampled 5-6 wines as a part of the tour and were able to sample some of their other wines for a few Euros a glass. We then drove to the scenic hermitage hill for a short stop. Great views of the valley and the Syrah vines. Next stop was for lunch where there are 3-4 restaurants in the area. The group split up since it would be difficult to accommodate the entire group with how busy each place was. Price varies by each place, but we ended up at Brasserie le Tainois and our meal was around 30 euros. We stopped at a second winery after lunch and had another 5-6 samples before taking a short drive to where we could walk among more Syrah vines. Julie then took us to Vienne where we split a bottle at another overlook of the valley and the city. We returned to Bellecour square around 7 PM. Really great experience with a great host and group.